Tiffany & Co Sterling Silver 18mm Bow Ribbon Diamonds Necklace 16"
This is a specially serviced stunning 'Bow Pendant' necklace made by Tiffany & Co. Hallmarks : Tiffany & Co. 925. Tiffany & Co.
Tiffany & Co. Sterling Silver Mini Ribbon Bow Charm Pendant 16" Necklace w/Pouch. Shipped with USPS First Class Package. Tiffany & Co Bow Pendant Necklace rare vintage design . Condition is Used. Dispatched with Royal Mail 1st Class. Other : Tiffany pouch, box included. Series : Bow Heart. Pendant size : 18mm x 17mm. This item ispre-owned. Have you been searching for a super versatile Necklace?. Your search is finally over! 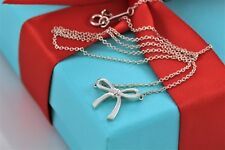 Sterling Silver Mini Ribbon Bow Pendant Necklace. Very pretty and elegant! The style is classic Tiffany, making it a piece that you will most certainly use over and over again. Tiffany and Co 925. Tiffany & Co. Diamond Earring. Gemstone Earring. Silver Earring. Fine Gold Jewelry. Silver Chains. Gold Chains. Tiffany & Co. ♡ Triple 3 Three Bow Ribbon Necklace ♡ 19-592. Other : Tiffany pouch & box included. Series : Triple Bow. This item ispre-owned. (This Will include an original Tiffany Pouch =). (Tiffany & Co. Box Not Included). Item includes a Tiffany Pouch Only (No Box). 1990 Tiffany & Co. 925. Ribbon Bow Pendant - 14 mm Wide. Sterling Silver. It's a beautiful necklace but it doesn't fix my baby sister anymore and she needs the money to pay for school. If you have any questions please feel free to ask! ! Thank you for looking and have a great week!! Here is a Fine Tiffany & Co 18KT Yellow Gold Bow Necklace. Made from Solid 18Kt Yellow Gold. Hallmarked Tiffany & Co, AU750. An authentic Tiffany & Co. marked Tiffany & Co. 925. 5/8" bow ribbon pendant 16" necklace. Please look at all photos, no Tiffany box or pouch, Thank you for looking. Classic and whimsical Tiffany & Co twisted bow necklace. Buttery 18k yellow gold bow has twisted rope detail and measures 1" in width. Pendant is suspended on a 16" solid gold chain. The tag at the clasp is marked Tiffany & Co and 750 Italy. Comes with original pouch and gift box. Mint in box condition. Non smoking home. Tiffany & Co. Sterling Silver Ribbon Bow Pendant Necklace 18" - Pouch. Sterling Silver Ribbon Bow Pendant Necklace 18" - Pouch. Other: Tiffany pouch is included. Hallmarks: Tiffany & Co. 925. Size: Necklace is 18" long, bow is 16mm wide. Tiffany & Co. ♡ Twisted Rope Bow Necklace ♡ 17-104. Series : Twisted Rope Bow. Other : Tiffany pouch & box included. Chain length : 16". This item ispre-owned. Tiffany & Co. Sterling Silver Teddy Bear With Bow Pendant Necklace 16"
Tiffany & Co. Sterling Silver Teddy Bear Charm Pendant Necklace 16". Sterling Silver Teddy Bear Charm Pendant Necklace 16". Hallmarks: Tiffany & Co. 925 on chain and pendant. Other: Tiffany pouch is included. Authentic Tiffany & Co. Ribbon Bow Pendant Necklace 18". Fully hallmarked & authentic Tiffany. or buy it for yourself to start or add to your jewelry collection. This is a classic & versatile design that you can wear with almost any outfit! Tiffany Co 18k Yellow Gold Bow Pendant Necklace 16” W/Pouch!! You are looking at a Tiffany & Co 18K Yellow gold bow pendent necklace. Fluid 18k rose gold accentuates the flowing design of this ring. I'll be more than happy to help. God bless. pendant is about 15mm across. Tiffany & Co. Sterling Silver Ribbon Bow Pendant Necklace 16"
Tiffany & Co. Sterling Silver Ribbon Bow Pendant Necklace 16". Sterling Silver Ribbon Bow Pendant Necklace 16". Hallmarks: Tiffany & Co. 925 on charm and chain. Other: No Tiffany box or pouch is included. This is a cute authentic pendant and chain necklace from Tiffany & Co. It is crafted from sterling silver with a high polished finish. The wide flowing ribbon is tied into a bow and it is attached to a classic round link chain. Tiffany & Co. Sterling Silver Cable Ribbon Bow Pendant Necklace 16". Sterling Silver Cable Ribbon Bow Pendant Necklace 16". Hallmarks: Tiffany & Co. 925 on charm and chain. Other: No Tiffany box or pouch is included. Beautiful classic authentic Tiffany Co. 18k rose gold 18" bow pendant necklace. Excellent like new condition. Tiffany & Co. ♡ Twisted Rope Bow Necklace ♡ 19-622. Series : Twisted Rope Bow. Other : Tiffany pouch & box included. Chain length : 16". This item ispre-owned. Tiffany & Co. ♡ Large Ribbon Bow Pendant Necklace ♡ 19-617-1. Other : Tiffany pouch & box included. Series : Bow. Pendant size : 27mm x 23mm. Chain length : 18". This item ispre-owned.